Senior Living services, including residential aged care facilities and retirement village opportunities are here as part of Springfield’s Health City. Located in Greater Springfield’s Health City, Aveo Springfield is a vibrant new community that is redefining retirement living. Its integration with nearby amenities such as the Mater Private Hospital and allied health partners, allows residents to receive comprehensive support in all areas of health, wellbeing and care. The community offers a modern and relaxed lifestyle, with many luxurious and beautifully designed community spaces for residents and their families and friends to enjoy. This includes a dining and kitchen area, café, lounge area with fireplace, on-site parkland, activities room and a gymnasium. Spacious, superior quality apartments ranging from 1, 2 and 3 bedrooms are filled with natural light and start from $299,000. Additional Serviced Apartments and a Health & Wellness Centre, including a hydrotherapy pool, will be completed mid-2018. One of the key considerations when choosing a retirement village is convenience. It is important to residents that there is an abundance of amenity in the immediate area. Fortunately, Greater Springfield was named the World’s Best Master Planned Community in 2010, and accordingly, first-class dinning, shopping and entertainment is available within just minutes of the complex. Being located in the heart of Springfield Central, residents can easily catch up with friends and family at the many cafes, restaurants, shops and cinemas at Orion Shopping Centre, or enjoy a sunny Springfield day at the spectacular Robelle Domain Parklands or the award-winning Brookwater Golf Course and club house. These are just some of the examples highlighting the convenience of the area, especially for those who love to lead an active lifestyle. The carefully considered and superior quality design of Aveo Springfield is another compelling advantage of seeking retirement living in the area. In addition to the community’s modern and sophisticated appearance, all apartments and communal areas were created to accommodate for the comfort and convenience of its residents. No detail has been overlooked. The open-plan layout of apartments, bench heights, the volume of natural light and balconies were specifically designed for the security, accessibility and enjoyment of aging residents. 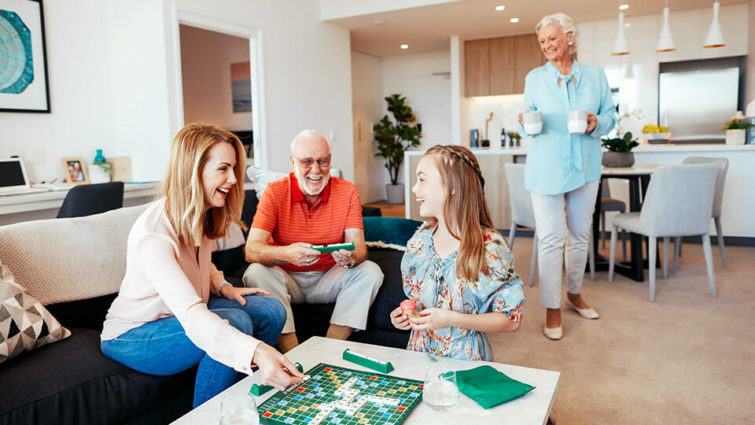 As the Aveo Springfield village grows with the new Health and Wellness Centre, Serviced Apartments and Residential Aged Care, residents will enjoy a sense of companionship and belonging as the village evolves into a community for life. The health and wellness of residents is the most important part of Aveo’s philosophy. The ‘Live Well’ philosophy that is at the heart of Aveo’s company vision includes a range of services and facilities such as a gymnasium, dedicated Health and Wellness Manager, on-site allied health including physio, podiatry and occupational therapy, as well as Aveo Care’s at Home service. Residents also have the luxury of having freshly-made, nutritionally balanced meals delivered to their apartment door. It is safe to say that no matter what the future holds for any resident at Aveo, they will have the protection of one of Australia’s best retirement and aged care providers. Fostering a sense of community is another integral facet of Aveo’s retirement villages. Whatever a resident’s tendency is toward living actively and socially, Aveo is there to support it. Weekly exercise classes, happy hour drinks, and morning teas are all venues where residents can mingle and get to know the village team. Shuttle buses also provide access to the Orion Shopping Centre at the heart of the city where many social encounters await. So, when considering a move into a retirement community, Aveo Springfield is the only option for a lifestyle of luxury, convenience, amenity, health and social engagement. No expense has been spared in the creation of a truly world-class retirement complex, in a location that is fast developing into one of the most exciting cities in Australia. Enquiry is made easy by submitting an online form, downloading the Aveo Springfield Factsheet or by calling 1800 316 933 to speak with one Aveo’s friendly team.